In the day following the listing the price of the coin jumped by 11 percent as of the time of writing. The market cap of ADA also increased to $2.276 billion. The altcoin is currently trading at $0.088 with a 24-hour trading volume of $115.353 million. You can see current prices on Coinmarketcap or the ADA trading page on Binance. The coin has been appreciating in more momentum for the last few weeks, and even though ADA has plummeted by -50% during the past two months because of the continued sluggish market trends, with the latest upward trend, ADA has risen by 12% for a 24-hour period. Furthermore, the Cardano management announced the launch of IELE (a Cardano Virtual Machine), which allows Cardano customers to easily develop dApps through the Cardano blockchain. The Internet Online Hong Kong (IOHK) and the Cardano Foundation are rumoured to be on the verge of inventing a widely accepted payment system of ADA, apart from teaming up on establishing solutions for some of the toughest challenges in the blockchain world. Since ADA is among the top ten major cryptocurrencies, a market recovery would surely boost its coin price along with BTC and ETH. The combination of an all-market increase and ADA’s technical advancements could propel the coin to serious multiples. We think it’s possible to see a 4-5x by January with these factors; but it won’t do it on its own. The entire market, lead by Bitcoin, will need to come. Could ADA Reach $.50 By January 1st? 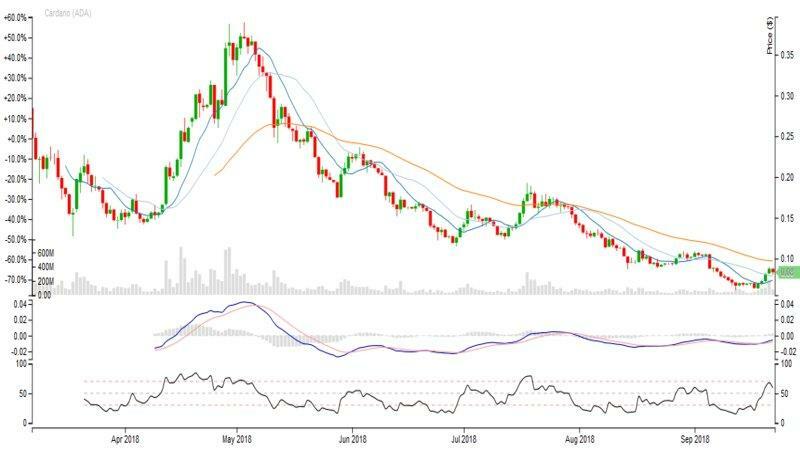 If you take a keen look at the historical ADA charts, particularly the previous quarter of 2017, you will observe that a time like this last year, ADA was valued at around $0.020. The current price of ADA is $0.080, four times better than that of last year, but ten times lower than its all-time high. With a successful implementation of these projects, ADA could bounce back to coin prices around the quarter of a dollar ($.25) mark. And that prediction was buoyed this week by seeing the response that the market had to Cardano’s new USD pairing on Kranken. On September 27 Kraken announced on a blog post that it would be listing Cardano on its platform. The listing on Kraken one of the biggest exchanges in the world comes as welcome news to many Cardano enthusiasts. On the platform the crypto-coin will have the following pairings: ADA/USD, ADA/EUR, ADA/CAD, ADA/XBT, and ADA/ETH. This comes after Cardano has shown a stable listing and volume on Binance, one of the largest exchanges in the market. See our guide on how to buy ADA on Binance here. First, we’ll look at the one-hour charts. 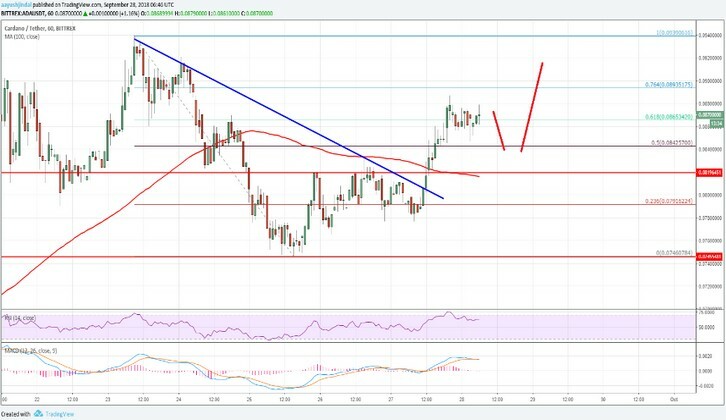 On the technical side of things, the rally seems to be set to continue after the altcoin broke a critical bearish trendline with resistance at $0.0815. The ADA/USD trading pair is currently trading above the trend line with a positive bias. Now the next resistance lies at $0.0900. It seems to coincide with the 76.4% Fibonacci retracement level experienced at the last decline from the $0.0940 high to a low of $0.0746. The technical indicators show that if the altcoin breaks the $0.900 resistance, then it could rally towards the $0.0940 level. It means the final targets for interested buyers may lie in between $0.0950 and $0.1000. The above chart indicates that the price of Cardano is trading with a solid technical structure that is above $0.0800. With the listing on Kraken, Cardano seems to be on the rise, and now we have to wait and see if the altcoin can maintain the momentum. But by connecting the price highs and lows on the weekly chart from as far back as May 2018 to the present time, we can see that the price action is starting to form a discernible falling wedge. Price action is presently on the upper trendline, with the price candle for the week closing as a bearish pinbar. If the chart is expanded using the daily chart, we can also see that price action has spent the last 5-10 days on the upper trendline of the falling wedge. The last few candles have been a combination of dojis and pinbars as well. The eventual outcome for the falling wedge pattern is for price action to break above the upper trendline, culminating in an upside reversal. But are we there yet, or is there still some price action left within the confines of the falling wedge before any such breakout occurs? Here are the possible scenarios as to how this setup is going to play out in the next few weeks. The borders of the falling wedge constitute the boundaries of price action until the breakout occurs. 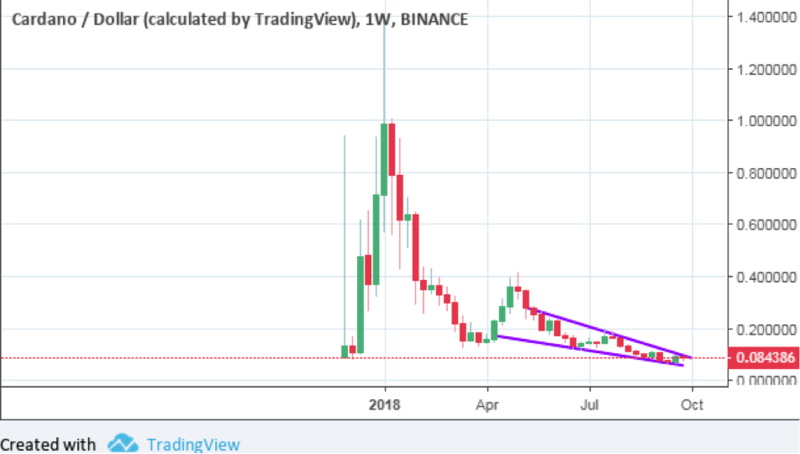 The appearance of the pinbar right at the upper trendline of the falling wedge on the weekly chart can only mean one thing: price will push to the downside, at least to the lower trendline acting as support. Usually in a chart pattern, the trendlines bordering the pattern will provide support and resistance for price action. Price will therefore move from one border to the other, even as the trendlines converge. Very close to the point of convergence (the apex), price is expected to breakout in an expected direction. For the moment, it appears that price action is not yet ripe for a breakout. Therefore it is possible that the bearish pinbar will provide a basis for further downside movement on ADA/USD, at least to the lower trendline support. It is also possible that price action may breakout of the upper trendline, leading to a completion of the falling wedge pattern. This is expected to be the eventual outcome for the ADA/USD pairing. But the question is: will it happen now, or will it happen in the future? There needs to be some positive news for the crypto market in general and also for Cardano specifically, for this to play out. Those who are bullish on Cardano, are advised to wait for price action to get down to the lower trendline support, from where long trades can be initiated. However, this may take some time to occur. This is because there is a minor horizontal support at the $0.08 mark. So a downward price move may stall at this area before it continues to the lower trendline. The current sentiment, however, is for prices to retreat from current levels. This is because the presence of a bearish pinbar at a resistance trendline is a lot more indicative of an impending sell-off, which will push prices lower. But when the upside breakout that is expected of the present setup does finally occur, traders can also re-enter on a pull back to the broken resistance, in order to ride the asset upwards. For those interested, the easiest way to get Cardano ADA is to use Binance’s trading platform. You can read our full beginner’s guide here, which will guide you from step one!